MHA defends highway ban, says it will be only till May 31 . 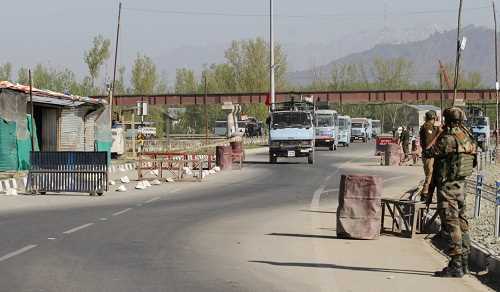 Defending the move to impose restrictions on a vital national highway connecting Kashmir Valley with the rest of the country, the Home Ministry said Wednesday that the step has been taken to ensure safe movement of forces and it will be continued only till May 31. The ministry said an impression is being created by some individuals that the highway has been closed for civilians which is “farthest from the truth”.During this period of 12 hours, alternative routes like old highway and other internal roads are available for commutation of civilians without any hassles. The ministry said restrictions were in place in Jammu and Kashmir earlier also and are imposed from time to time in other parts of the country, for movement of the convoys of forces.The restrictions have been re-imposed, after taking into account the requirements of students, patients, etc. and also ensuring minimum public hindrance, it said. Previous articleJRL calls for shutdown tomorrow, on election days in poll constituencies.